This unique ‘rocking whiskey glass’ is a top promotional item idea for whiskey brands. Its unique design lies at the bottom of the glass because it stands on a slight tilt and rocks around gently with a slight touch. This ensures that the glass is always balanced and it never tips over. It makes a pretty neat alternative in comparison to the standard rock glass found elsewhere. Boost sales with this promotional item! The rocking whiskey glass can be utilized in many ways. On pack promotion – It could be offered as a gift with purchase together with whiskey bottles. For example, in airport duty free shops where alcohol gift sets are often offered with additional gifts included. Promotional gifts acts as an incentive to encourage the customer to spend more on purchases. Expensive alcohol gift sets are a common choice of gift all over the world. So there is a high chance that this unique promotional item will be widely used and it will really help enhance sale. Point of sale promotion – The glass could be used in bars to promote whiskey. 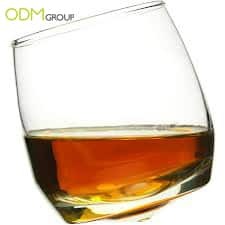 A branded rocking whiskey glass would arouse curiosity and help with brand recall. If this rocking whiskey glass is used in more bars, it can help excite the whiskey drinking experience of customers. It may even entice women to try whiskey or mix drinks from the cool rocking glass. More Publicity – Because of its novelty factor, this will pique interest from customers all over the world. With the higher level of interest about the promotional item, the more recognition your brand will receive if you stamp your logo on it.